Doors play less of a role when it comes to energy efficiency as you may think. Doors are a very small part of the surface area of a house and usually don't allow significant amounts of warm air to escape. Models that are Energy Star qualified come with tighter frames, energy efficient cores, and double or triple panel insulating glass on models that come with glass. More information can be found at Energy Stars website. Unless you're simply replacing a bad or broken door, most doors come as a 'door system' meaning it comes with the door and frame and any accents, such as sidelites, already framed. 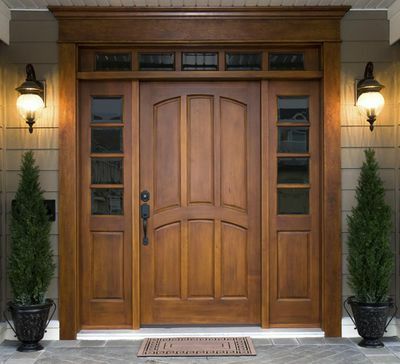 If you decide to go with a bigger door, you'll need to call in the pros unless you're a skilled contractor as they will need to completely re-frame your entry way. In tests with a battering ram, nearly every door, no matter the material, failed at the lock. Use 3 inch long mounting screws that go in past the door jamb and into the frame. This page was last modified on 1 August 2015, at 22:15. This page has been accessed 56,583 times.